Like so many others, Dr Lachlan Kesteven grew up with a fascination with all animals great and small. While Lachlan was always interested in becoming a vet as a young boy his drive to become a vet didn’t eventuate till his early 20s. He grew up in Tropical North Queensland Cairns where he graduated high school. Dr Lachlan Kesteven went onto do a year of Law/business degree and finding this wasn’t to his liking before he traveled overseas for close to two years. Before returning to Australia, he focused on his goal of becoming a veterinarian. 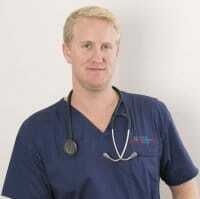 Dr Lachlan Kesteven graduated his bachelor of veterinary science from James Cook University in 2011. From there he worked in a mixed veterinary practice in Proserpine/Whitsundays for three years, during the same time he worked as an auxiliary firefighter adding to his practical and emergency skill base. Lachlan began work at Animal Emergency Services in 2015 and hasn’t looked back since. Every night brings new challenges as you never really know what will come through our doors. Animal Emergency Services has been a fantastic place to develop Dr Lachlan Kesteven’s knowledge and love for emergency and critical care medicine.